Don't get too worried about possible spring flooding, yet. In its first flood outlook for this year, the National Weather Service says the chance of flooding along the Mississippi and other rivers in this area is "normal to below normal." Hydrologist Jessica Brooks, at the Davenport office, says snowfall has been lower than usual, and the snow we've received has a low moisture content. "Combine the lower precipitation with lower river stream flows that we're also seeing at this time of year. And dry soils - a lot of the area is at least in 'abnormally dry' drought condition." But the ground is frozen much deeper than usual thanks to frigid temperatures and no snow cover in late December and early January. The depth is 1 to 2 feet here, and up to 4 feet deep upstream in Minnesota and Wisconsin. "If we would happen to get rapid snow melt of what is out there, along with some heavy spring rains, instead of having that water percolate into the ground, it's just going to run off into the river system." 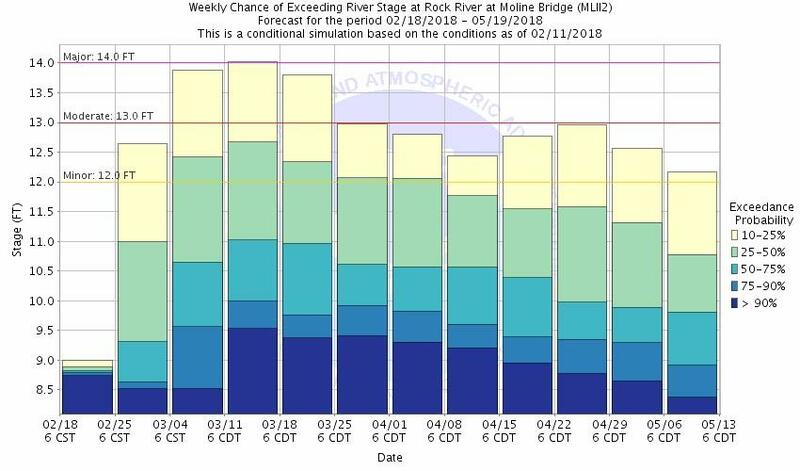 The National Weather Service now says the chances of the Mississippi River reaching flood stage in the Quad Cities this spring are 48 per cent. There's just a 38 per cent chance of reaching one foot over flood stage here (moderate flooding), and only 20 per cent that the river will rise to three feet over flood stage - what the weather service considers major flooding.